Though you may be familiar with night club owner Lindsay Lohan’s recent troubles, namely her dramatic split from questionable billionaire Egor Tarabasov and work with Syrian refugees, you may not have heard her speak since Mean Girls. As such, the following video may come as a shock to you, because Lohan no longer sounds like her old self. She sounds like sad attempts at French, Greek, English, and (oddly) Australian accents were combined with Elmer’s glue and not allowed enough time to dry. 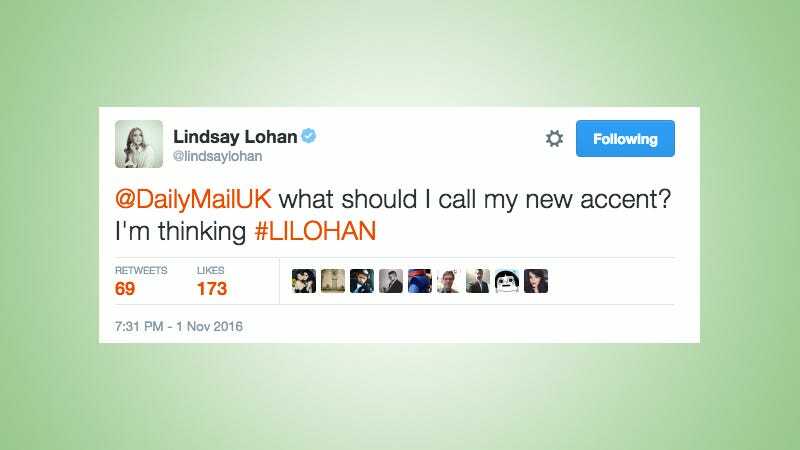 The new accent, which she named “#Lilohan” after noticing it was being written about online, is strange and hypnotic. Is all of her recent jet setting playing game with her brain, is she trying to sound more refined and compassionate, or is this just another case of Famous American Moves to Europe Syndrome? Listen to it below and see what you think. So there you have it. Michael Douglas is never right. Imagine a world where this is true.